Guns N’ Roses have prematurely announced the release of the Appetite For Destruction boxset. 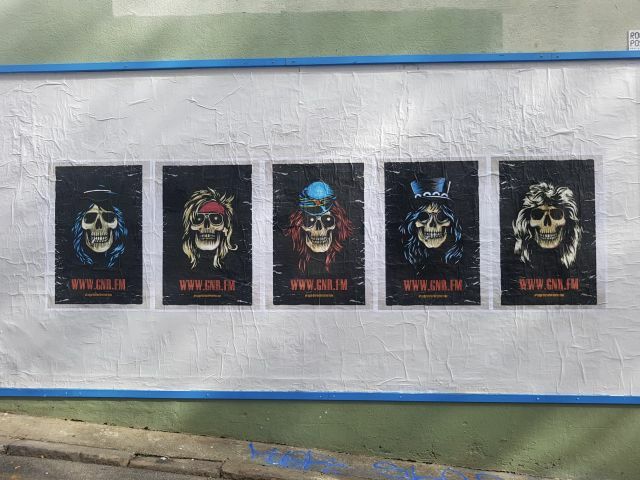 Guns N’ Roses posters teasing something to do with the band’s 1987 debut album Appetite For Destruction have appeared in Sydney and Melbourne, as speculation continues that the band could be reuniting its classic lineup. 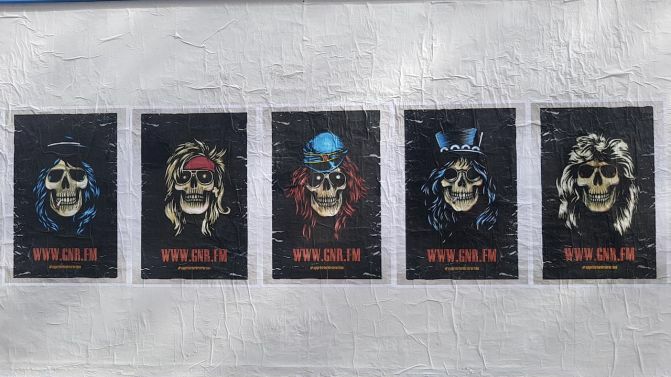 The posters, which have been posted in the Sydney suburbs of Surry Hills and Parramatta and the Melbourne suburbs of Southbank and Collingwood, feature illustrated portraits of GNR’s debut album lineup of Axl Rose, Slash, Duff McKagan, Izzy Stradlin and Steven Adler. The posters also refer to the website GNR.FM, and contain the hashtag #appetitefordestruction. The GNR.FM website contains a map showing the location of the teaser posters and billboards across Australia, Japan, Western Europe, Canada and North and South America, as well as a countdown clock which is set to end at 2pm AEST this Friday, 4th May. The site is also playing a loop of the song ‘Shadow Of Your Love’, which was first recorded during Axl Rose and Izzy Stradlin’s days in Hollywood Rose, before being released by GNR as an Appetite For Destruction B-Side. While some fans are hoping for a full-blown reunion tour, others believe the band are teasing an upcoming reissue or box set for Appetite For Destruction with B-Sides, new merchandise and bonus material. The album celebrated its 30th anniversary last year. Posting a photo of the teaser posters on Facebook this morning, former GNR drummer Steven Adler — who will be touring Australia in a few weeks — said, “The five of us together made the greatest rock album of all time. Last month, a billboard was spotted in London featuring GNR’s Appetite For Destruction members. While most of GNR reunited for the huge Not in This Lifetime… world tour in 2016, Stradlin and Adler were left out. Adler later said he hoped the full band would reunite for Appetite For Destruction‘s 30th birthday, and the band have been teasing something big ever since. Catch more photos of the Appetite For Destruction teaser posters below, as we wait for the countdown to end.